The first official poster for the upcoming live-action Disney Plus Star Wars series The Mandalorian has been revealed. 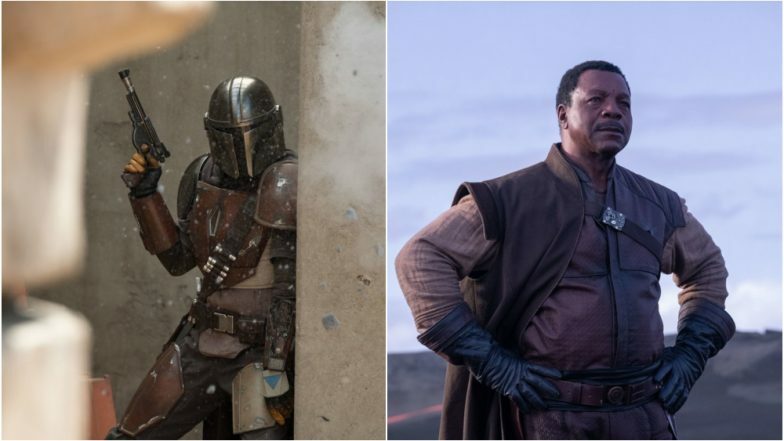 The Mandalorian, a new live-action series debuting on the Disney+ streaming service, stars Game of Thrones star Pedro Pascal in the lead role. The series was written by Marvel's Iron Man director, Jon Favreau, who is an executive producer alongside Dave Filoni, Kathleen Kennedy, and Colin Wilson on this project. The live-action series will also star Gina Carano, Giancarlo Esposito, Emily Swallow, Carl Weathers, Omid Abtahi, Werner Herzog, and Nick Nolte in key roles. While Dave Filoni will direct the first episode of the series, Thor: Ragnarok director Taika Waititi has also been roped in to direct a couple of episodes and we are thrilled to see what he brings forward. Speaking about the series at the launch event, actor Pedro Pascal said, "The Mandalorian is a mysterious, lone gunfighter in the outer reaches of the galaxy.”Star Wars: Episode IX Teaser: Ian McDiarmid’s Emperor Palpatine Returns and Daisy Ridley's Rey is Determined to Fight Him (Watch Video). The teaser of the series was shown publicly. The studio confirmed the series will be releasing in November. As for the timeline of the series, producer Jon Favreau confirmed that it takes place five years after Return of the Jedi. The Lego Movie 2, Aladdin, The Lion King, Star Wars Episode IX - 30 Hollywood Non-Superhero Movies of 2019 We are Super-Excited About! Star Wars fans were already on a high after the episode IX teaser was released earlier this weekend and with this announcement, the joy has been doubled.